The 1867 rate book describes this as a six-roomed brick hotel, conducted by Mary Ann Tonkin. 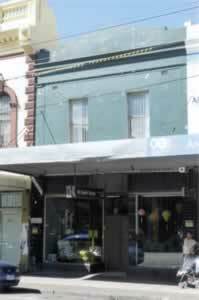 The existing building is certainly the same one that was there in the 1880s, but seems likely to have been re-built, perhaps in the early 1870s, as it is now one of a very similar group of shops which replaced shops which in 1867 were of timber construction. The hotel changed publicans even more frequently than it changed its name. Luckily William Cuffley was there for long enough to have a photo taken for posterity. 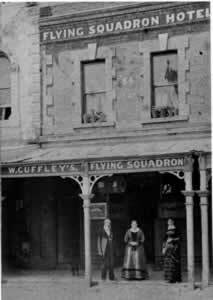 By 1883 Cuffley, who had operated a number of hotels around Melbourne and from 1878 until 1882 had been licensee at Steeth's Family Hotel in Wellington Street, was ensconced at the Flying Squadron where he stayed for four years. Family reminiscence has him as a kind and jovial sort of fellow - well suited to the role of publican. Alongside William and his wife in the photograph dating from the mid 1880s is his niece Emma Rosina Evans, whom he had taken in after she was widowed. The name of the hotel at this time refers to a British naval squadron.